It can be a challenge to explain to new authors that they need to consider their marketing plans before making arrangements for book design and production. They want to know why they can’t just publish the book they want to publish and worry about the rest of it later? After all, many new authors have pictured their first book—the one they’ve been working on for so long—in their minds for a long time. But in book publishing, we don’t plan and produce books to please the authors, we do it to please our readers (and buyers). 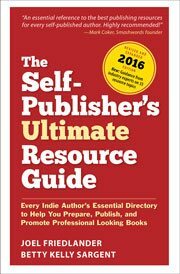 Are you publishing the right book? Is the form in which you plan to publish the book consistent with its content and the way it will be “used”? This applies to the interior of the book and the overall physical proportions as well as the right content. What are the expectations within your genre or category? If you put the book you’re planning next to a few best sellers in your genre, would it look like it belongs? Does your book stand out, offering something new or different that can’t be found elsewhere? Can you plan to exceed the expectations? Is there something you could add to your production that would enhance your marketing? Particularly for print books, there is a wide array of special finishes and binding that might enhance your book’s appeal. Foil stamping, die cut covers, paperbacks with flaps, special papers may allow you to really set your book apart, as long as the additions represent real value to your audience. For ebooks, additional resources and ways to interact with the author can be powerful incentives for audiences. How sensitive is your market to pricing? Quality improvements and variations like special finishes cost extra money. Money spent in direct production costs may be difficult to recoup due to discounting unless your market or the special appeal or utility of your book allow for higher than normal retail prices. Clearly, if you are an author who can sell direct, you’ll have much more flexibility in your pricing and far greater profits per book sold, but this requires having access to the market that wants your book. And if you’re planning to support your book publishing with advertising, have you factored the cost into your book retail pricing? Do you want to fit in, or stand out? Many of the marketing decisions we make are to conform to industry standards or the expectations of readers of books like ours. But effective marketing also suggests that if we can make our book stand out from other, similar books, we stand a much better chance of getting the attention our book needs to maximize its readership. In other words, have you done your marketing homework before diving into the design/production of the book? The concerns throughout this list should tell you that marketing that begins with the concept of the book, and knowledge of its natural market should inform all the design and production decisions we make about publication. A book designed to be a collectible, or one published with exclusive information that’s not available anywhere else, or a book with the most up to date practices for a specific kind of activity or profession, will be priced—and produced—quite differently from a genre novel, or from each other for that matter. Print in black and white or color? Hardbound or softbound? When it comes to deciding how big, what kind of paper, how the book is presented or branded, how its “offer” is communicated, all these decisions should be asked at the very beginning of the project. Do you think about these things when you plan your books? I’m looking for covers for at least 2 novels I’ve written. Don’t know how to go about seeing samples. One is Persian Moon (book 1 of a trilogy that’s a bi-cultural saga) and the other is Target (about a banker). I also edit books and clients looking for covers. I’m somewhat overwhelmed and don’t know how to get the job done.